Join Gold Pass for many great benefits including free programs, additional training materials, discounts, and premium access to tutorials and programs. See an inventory of Gold Pass content here. 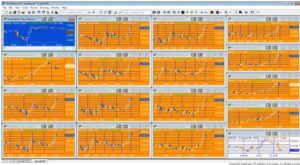 A Gold Pass member asked me how to force a re-calculation of a number of charts at specific intervals. This tutorial uses some of the techniques from tutorial 115, in particular the use of the Timer to issue a RecalculateException at a specific time and then at set intervals after that. One of the issues to address is that after the RecalculateException the program is reloaded with the alarm datetime that was a original input. Since this alarm has been fired, we know that this datetime is now in the past. I address this problem in the InitializeComponent part of the program by testing whether the alarm time is in the future or the past. If it is in the past I add the interval (i.e. the time interval that we want the alarm to re-fire the RecalculateException) and test the alarm time again. If it is still in the past I add the interval again and retest, I keep doing this until the alarm is in the future. The program then waits until this datetime is reached and then refires, I explain this in the video below. The EasyLanguage DateTime class used in this tutorial defines the structure for an object that provides information about the system date and time. It is not be confused with the EasyLanguage datetime, a double precision decimal value that represents the combination of a Julian Date and time using the standard Window Date format (i.e. day.time). i.e. 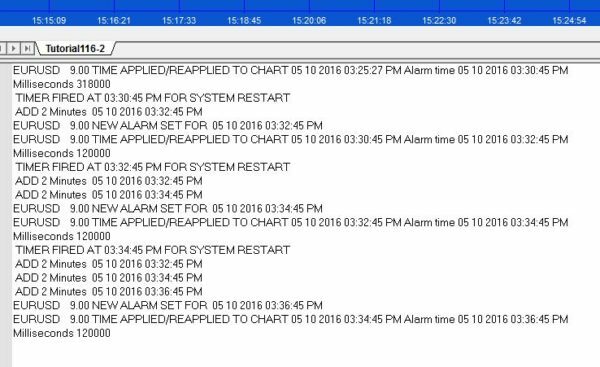 the program was applied to the chart at 3:25:27 and the first alarm was set at 3:30:45. The alarm input remains at 3:30:45 BUT we add two minutes to the alarm object which is now set to go off at 3:32:45. The alarm input remains at 3:30:45 BUT we add two minutes to the alarm object so it becomes 3:32:45. However this is still earlier than the current time to we add another 2 minutes so the alarm is set to go off at 3:34:45. 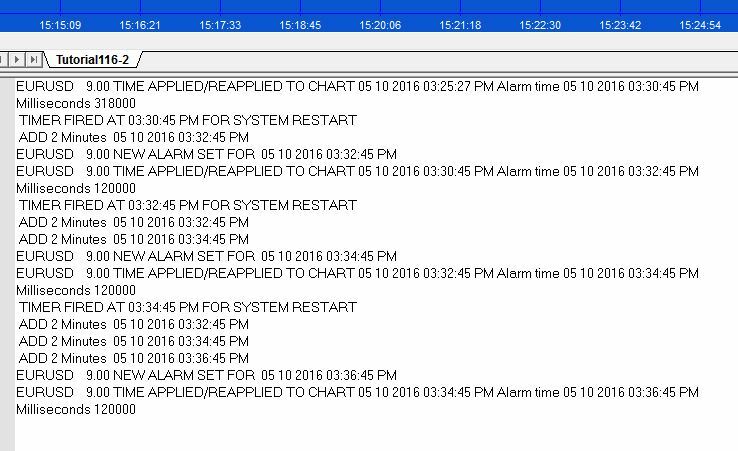 This time the program adds 2 minutes to the NewAlarmDT object so that the alarm time becomes 3:36:45. The program continues in this manner. The program is available FREE to Gold Pass members and for download for a small fee for others. Tutorial 116 applied to a 9s EURUSD chart. The interval is set at one day. Tutorial 116 is available for IMMEDIATE download for $9.95 by clicking the ‘add to cart’ button. After download the program can be opened, you will be able to see the program code and modify it if you wish. After purchase you will be redirected to a download page, so don’t close the browser. 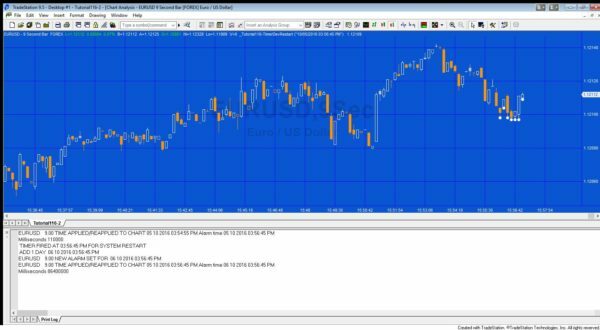 Tutorial 116 was developed for TradeStation 9.5 (update 15) and, unfortunately, will not work with MultiCharts.